With so many handhelds having emulator ability, for probably less than 50 bucks, this is a completely useless and awkward piece of machinery. And they use marble madness in the pic - the best game ever... for NES. Still, I'll stick to my HDTV. 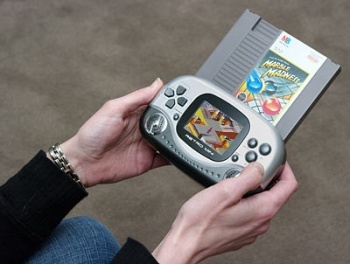 I want this, but for N64 cartridges, which are more manageable size-wise (though still huge by handheld standards). i burst out laughing at that picture. it just looks so... cumbersome. oh well, nice idea, but it was never gonna work. and fifty quid, your having a freaking laugh aren't you? i guess some will by it for nostalgia's sake though. I'm older than Keane NG?! Dear god almighty! I'm having a mid-life crisis! Best laugh I've had all day, I've never seen a console that's cartridges are bigger than it! Can you imagine how bulky that thing would be with the Game Genie attached? For that matter, how is my gun going to work on that screen for Duck Hunt? Naw, I don't want a NEW handheld device, I want all the good old NES games on a DS flashcart. Oh, and if anyone is looking to replace their old NES as Keane suggested, I saw the coolest two things in a local game store. First one was a DoubleNES (not it's actual name). It was a NES and SNES both combined into a console the size of a SNES, cart slots for both game types, SNES-clone controllers, and a switch on the front to change from one system or the other. Second toy was the same thing in an ugly black gloss plastic, but in addition to NES and SNES, it took Sega Genesis and some other console I never heard of's games. Just a few years too late with this idea. I dont have that many NES cartridges hanging around my house to make me want to dump 50$ on this thing. At least you have an established career as a software engineer SharedProphet. I'm still stuck working at retail stores even after getting my B.A. All of this is trumped by SEGA surely. I had a Game Gear back in the day (which of course, I mostly had to play at home attached to a power socket), and that was essentially a portable Master System. Even now, you can get a whole collection of SEGA games for the PSP. I feel Nintendo are missing out on some extra cash (not that they need it! ), with the huge back catalogue of NES, GB, SNES, GBA etc. games. Of course, some studios prefer to just release updated versions (e.g. Square-Enix) instead. Its all the fun of an NES game, with the cost of public humiliation! 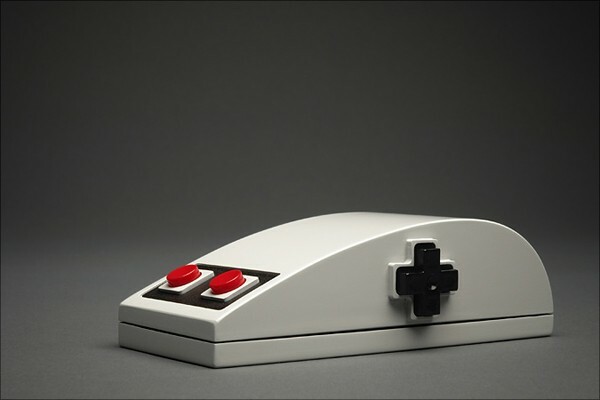 Don't know why i'd want to portibalize (it could be a word) my NES. It's not like I play games on the go. Though I was suprised I was older than Keane, I guess I just figured all the escapists employes were in there 30s or older. I already have an emulator on my laptop. This looks like an okay idea, but paying anything for any form of the NES at this point seems stupid. While it's an interesting idea, I don't really need to buy a new system to play the FIVE NES games that survived those many years of use. I'll stick with my old NES. You, know, I don't care that it's fifty Bucks. I don't care that it looks humongous. All that matters is the Fact that I can play Mach Rider on the go. I'd buy it if I had 50 bucks lying around. No I wouldn't.But I'd buy if I had like, 50.000 bucks lying around.I guess. You think it supports the power glove? Except that this would be considered legal, whereas roms are not...unless you are the proud owner of the original NES cartridge, of course. I can get the dual NES/SNES (technically Famicom/Super Famicom) consoles for 4,000 yen at the local Don Quixote and I've been tempted but the ultimate problem is still where do you get your hands on your piece of the ever-diminishing supply of cartridges? I also keep seeing various knockoffs of Mario and many of the classics, so have any of these old school games been out long enough for the copyright to expire?